David Cameron says the system of party funding in Britain is "a mess", as he prepares to meet Tony Blair to discuss the fallout from recent sleaze claims. The police and Electoral Commission are investigating both parties after it emerged they had both received loans which they had not officially declared. There were "cash for peerages" claims - denied - after it emerged some lenders had been nominated for honours. 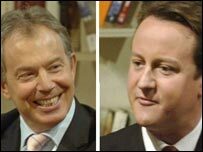 Mr Cameron and Mr Blair will meet formally for the first time at the House of Commons on Tuesday evening. Commenting on the funding controversy, the Tory leader said: "I am the only leader of a major political party that has actually come up with sensible proposals for reforming political party finance in this country and for cleaning it up - and I am putting this to the prime minister today. "We have a relatively uncorrupt party system but we do have a party funding system that is a mess." Mr Cameron said he would be outlining his plans to Mr Blair for a cap on donations, tax relief for small donations to encourage new membership and "modest" state funding. "I think it's the right way forward to get rid of the impression that somehow rich people or big organisations or trade unions can buy influence or even get a seat in the legislature." At present anyone donating more than £5,000 has to be named - but people lending money do not have to be. The fact people had lent millions of pounds to Labour and the Tories in 2005 emerged only after claims, which have been denied, of "cash for peerages". Labour has since named 12 businessmen who loaned the party almost £14m in the run-up to the general election. The Tories have named 13 backers who lent them £16m, and say they will show the Electoral Commission a list of names of other people who lent money. The meeting comes as a Metropolitan Police continues its investigation into "cash for peerages" allegations. It also follows an Electoral Commission request to the treasurers of the main parties urging them to declare all loans which "are not on commercial terms", including those which "may be converted into a donation at a later stage". Labour named 12 backers - including property developer Sir David Garrard (£2.3m) and Science Minister Lord Sainsbury (£2m). The Conservatives have insisted they will not disclose the names of two benefactors understood to have loaned money on condition of anonymity. But Theresa May, shadow leader of the Commons, says the Electoral Commission will be shown a full list. The party's biggest individual lenders so far identified are former treasurer Lord Ashcroft, with £3.6m, and Lord Laidlaw, with £3.5m. The Conservatives owe £37m in total, having borrowed £16m from a bank to buy the freehold on its former headquarters in London's Smith Square, and £4.7m from local associations. "It may be that these loan arrangements conform to the letter of the law, but they do not conform to the spirit of the law and to the principle of transparency on which it is based," he said. "Clearly, this would close the door on new or smaller parties who are struggling to make the breakthrough into Westminster such as ourselves or the Greens, or parties who only have a single MP, such as Respect and the Kidderminster Hospital campaigners," said UKIP leader Roger Knapman.